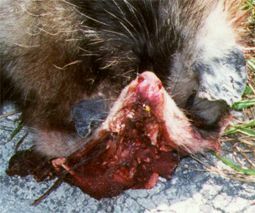 This Opossum was killed on Stringfellow Rd. in Pineland. 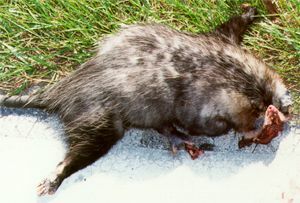 Opossums, like Armadillos move slowly, see poorly and almost always struck at the roads edge as they nose their way onto the roadway. You will typically only see them at night where their eyes give off a vivid reflection. This one got its face removed so probably didn't have to die a long slow painful death.